Very fast 20x wager requirement. Enter WELCOMEBONUS when making a deposit. Bonus must be cleared within 30 days. Get some extra funds to play your favorite slots by using promo code WELCOMEBONUS with your first deposit to receive 100% up to $200. This bonus requires you to place bets equal to 25 times your deposit plus bonus before making a withdrawal. If you decide to max out the bonus by depositing $200 and receiving a $200 bonus, then the amount you’ll have to wager is ($200 + $200) * 25 = $10,000. At $5 per pull, you’ll need 2,000 spins on the slots to clear the bonus completely. This bonus is cashable, meaning you can withdraw it and any winnings after you complete the WR. Bonus must be earned within 30 days. When using the initial deposit bonus to play slots, you will receive a 100% bonus up to a maximum of $200. You’ll have to wager 30 times the bonus amount before making a withdrawal request. If you deposit $100 to receive a bonus of $100, then you’ll need to bet at least $100 * 30 = $3000 in order to clear the bonus. Bonus must be earned with 90 days. If you can click a mouse, tap your finger, push a button or pull a handle, you can play slots games! Regardless of whether you play them online or in a physical casino, slots are among the most entertaining games to play. Slots machines are colorful, loud and popular with veteran and new gamblers alike. Not only can you play for as little as mere pennies and nickels, you can bet on multiple lines before every spin of the reels. Even better, you don’t need to be a master mathematician or strategist to enjoy slots because every win you score or loss you incur is determined by luck and luck alone. Slots machines can be distinguished from one another in various ways. For instance, some machines have three, five or seven reels and up to 50 lines. Some slots games give you the chance to enjoy bonus features such as free spins or bonus games that give you the opportunity to win big. Progressive slots games pool a portion of each bet made on every machine that has the same theme into an increasingly larger prize pool that will eventually be won by a person playing that particular game at the right time. Multi-line, or multi-payline, slots generally have three or five reels and you can win not only on horizontal lines, but also on lines that cut across the machine’s rows and columns. Multi-spin machines give you the chance to play your game of choice several times simultaneously, meaning the machine will have several separate sets of reels that will spin as independent games every time you place a bet. Fruit slots allow you to move the characters on the wheels you spin and/or hold up to two reels to try to increase your chances of winning. Slots machines also differ by theme. Some slots machines have games that are based on popular game shows such as “Wheel of Fortune” while others have themes that were created with movies like “Aladdin” in mind. 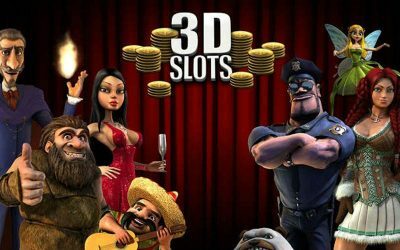 In fact, the variety of themes is so broad-based that if you can imagine a theme that would appeal to you, the odds are reasonable that you can find a slots machine based on it online, in a casino or both. Many slots games share characteristics with each other. A machine can have a multi-line, multi-spin game, for example. A progressive slots game might also give you the opportunity to try your hand at a bonus game. 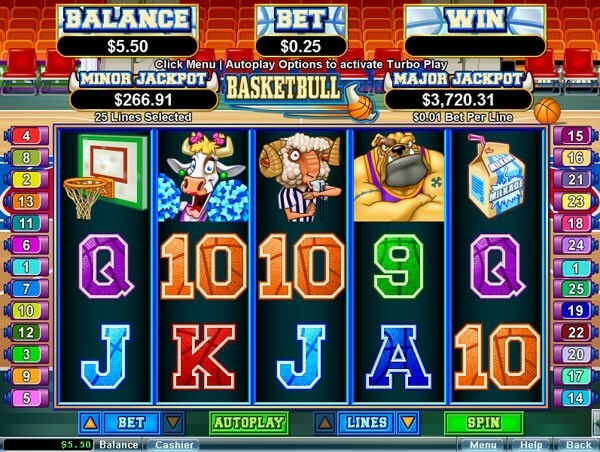 Here is a look at a slots game named, “Basketbull.” Like all online slots machines, this one is vibrantly colored and inviting to play. Basketbull is obviously a basketball-themed game that has 25 lines. Basketbull had bonus features that include free throws and free games that can yield extra cash if you make a basket or win a game. This game is progressive which means you have a chance to win a constantly growing jackpot every time you spin the reels. A popular slot machine “Basketbull” at Party Casino.Here is a peek at “Shark School,” a fun slots game that obviously has a shark theme. Unlike Basketbull, Shark School is a multi-line game that does not have a progressive jackpot. The machine does have bonus games that you can play if you hit the right combination of symbols, including Bad Sharky, Don’t Eat the Teacher and Swim Fishy, Swim! As you can see from the picture below, the person playing just won a dollar by playing all 50 lines for two cents apiece and hitting a triangular sequence of symbols across the bottom three lines. 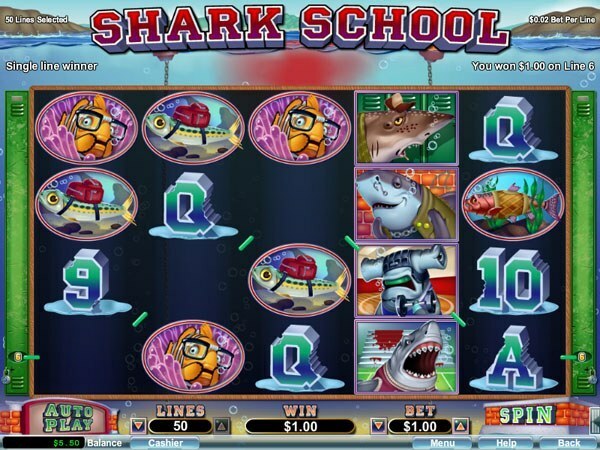 The slot machine “Shark School”. For many slots enthusiasts, the games are attractive because they require no advance preparation to play. There is no strategy that can be employed, which will make it more or less likely that you will win money on a given spin because slots are games of pure chance. Each slots machine at every reputable live and online casino has a random number generator which ensures that every spin yields a truly arbitrary result. A machine’s RNG constantly produces a random string of numbers even when no one is playing the game. When you initiate a spin by pulling a lever or pushing a button with your finger or mouse, the RNG determines the outcome of the spin by assigning the next number of numerals in the string that equals the number of reels used by your machine (i.e. if you are playing on a three reel machine, the RNG will use the next three numbers, but it would use the next seven numbers if you were on a machine that had seven reels). Every slots reel has 22 stop positions that can be activated by the numbers the RNG generates and then condenses. If a certain position will yield a high payout, it will not have as many stop numbers as a position for a lesser payout will. It is the nonstop creation and condensing of stop numbers that guarantee every spin has a genuinely random result. The RNG’s activities are also what make all legitimate slots machines games of chance or luck. Given the incredible variety of slots games that you can play on your computer or mobile device or in a brick-and-mortar establishment, it’s important that you find a game that you will enjoy playing. Before you make an investment in a particular machine, check out the different themes you might like. As you investigate the available themes, you should also look at the minimum and maximum bets you can make on each machine. Make sure you choose a machine that not only catches your attention because of its theme, but that is affordable for you, too. Nothing will affect your fondness for slots more than going bankrupt because you chose a machine that was simply too expensive for you. Another factor you should give some serious thought to when you are deciding which slots game to play is a machine’s payout table. Payout tables can easily be found on the front of a machine in a live casino or on a designated web page in an online casino. A machine’s payout table will show you how much you will collect for each winning combination you hit while playing on that machine. A slot machine payline is the order of characters that appear across a machine’s reels after they are spun. Depending on the machine, paylines can be in almost any direction and even in a zigzag pattern. Generally speaking, if a given payline includes at least two of the same characters, the line has a winning combination of symbols. A payout percentage is the percentage of money people can expect an individual slots machines to pay out over time. Typically, a machine’s payout percentage is set by gambling laws and they range between 82 percent and 98 percent. It ordinarily makes sense to play slots games that have the highest payout percentages for lower paylines. It also makes sense for you to play slots in which you are able to make the highest permissible wagers on the maximum number of paylines in order for you to collect higher payouts and, possibly, the most lucrative jackpot possible if you are on a progressive machine. Here is a picture of the payout table for the online slots game, “Achilles.” As you can see, the table includes all of the game’s winning combinations and the corresponding pay amounts for each of them. The page also shows the game’s paylines at the bottom. 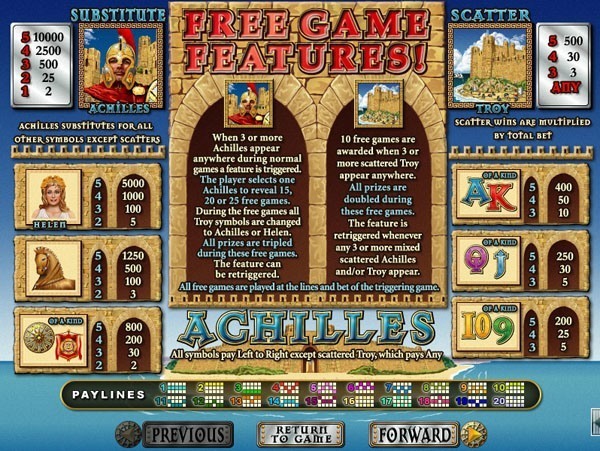 The pay table from the slot machine “Achilles”. Once you have chosen the slots game you want to try out, it’s time to start playing. Because there is no strategy that will increase the likelihood that a given spin will put money in your pocket, you don’t need to study anything before you play. All you have to do is figure out how much money you want to bet and the number of lines you want to play. Remember, if you choose to wager on more than one line, the amount of your bet will be multiplied by the number of lines you are playing. For instance, if you are playing ten lines and make a bet of $5.00, one spin will cost you a total of $50.00. After you have selected the number of lines you are going to play and placed your wager, pull the machine’s handle or press the spin button with your finger or mouse. As with any casino game, being aware of and adhering to certain principles while you play slots games will enhance your experience whether you win or lose. For example, setting a budget and sticking to it will avoid causing you stress about having lost money you could not afford to lose. Put simply, if you have lost the amount of money you designated for your slots play, stop gambling immediately. If your bankroll is small to begin with, consider beginning to play on slots machines that have either three or four reels as they will generally yield more frequent payouts than machines that have a larger number of reels. Remember that slots are games of chance. Winning on one spin does not increase or decrease your chances of winning or losing on the next one so there is no reason for you to abandon a machine you enjoy playing on simply because it paid you off on a given spin. If the casino you are visiting has a VIP or frequent players’ program, join! By accumulating points, you might get to enjoy some free comps and/or bonuses. Playing slots games is fun no matter where you do it. If decide to play online from the comfort of your home, you will still get to enjoy many of the same games you would find in a physical casino. Of course, if you choose to play in a smaller establishment such as a local bar, there will be a smaller number of games available for you to try. There is no difference between playing online or in a casino in the context of your chances of winning on a given spin. As was stated earlier, every spin on each slots machine on a reputable website or in a respected casino is determined by a random number generator that guarantees the game is fair. Where there is a difference between playing slots on the Internet versus playing live is in the environment. Playing online allows you to have complete control over the environment in which you play. You can turn the sounds a machine makes up, down, on or off at will simply by adjusting the volume on your computer, for example. When you play in a casino or another establishment, you can only control the way you play slots games. In exchange for giving up control of your environment, you get the benefit of enjoying the company of other people who play slots. If you are in a casino, you will generally be able to receive free beverages and accumulate comp points that can be exchanged for free rooms, merchandise or meals as well. Of course, online casinos often have VIP programs that offer benefits not provided by physical casinos. The more you play slots games at almost any online casino, the more likely it is that you’ll get access to increasingly lucrative benefits which might include deposit bonuses and/or working with a personal account manager. Party Casino has nearly 100 slots games people can play any time of day or night! Designed by Playtech, Bet363’s machines mimic physical machines in almost every way, but they are even more colorful and fun to play on! To keep up on all the promotions and to learn more, you can check out our Party Casino.com Casino review. Claim Your Slots Bonus Now!